The submarine fleet of Royal Australian Navy is composed of six Collins-class boats. 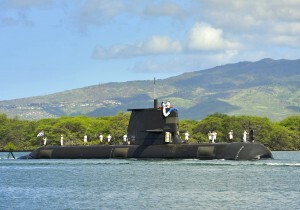 The HMAS Sheean SSG 77 is the fifth boat assigned to the fleet. 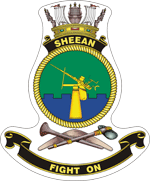 She was named in honor to the Ordinary Seaman Edward Sheean. She is the only submarine of the class to be named for an enlisted sailor—the boat was laid down in 1994 and launched in 1999. As in the case of the Dechaineux, she was modified and fixed during the construction to solve some design problems detected in the first units of the Collins-class. As one of the main training missions, the submarine participated in RIMPAC 02, where Sheean was able to penetrate the air and surface anti-submarine screens of an eight-ship amphibious task force, then successfully attacked both the amphibious assault ship USS Tarawa and the dock landing ship USS Rushmore. In 2006, Sheean was presented with the Gloucester Cup for being the RAN vessel with the greatest overall efficiency over the previous twelve months. Sheean was docked for a long maintenance period in 2008, but workforce shortages and malfunctions on other submarines requiring urgent attention have drawn this out. The submarine was formally returned to service on 23 February 2013. On 16 July 2013, Sheean was damaged while berthed at the Australian Marine Complex. Combi Dock III, a freighter owned by Dutch company Combi Lift and intended to supply the Gorgon gas project, broke free of moorings during a storm, and drifted into the submarine, causing damage to Sheean ’​s propeller and steering apparatus.